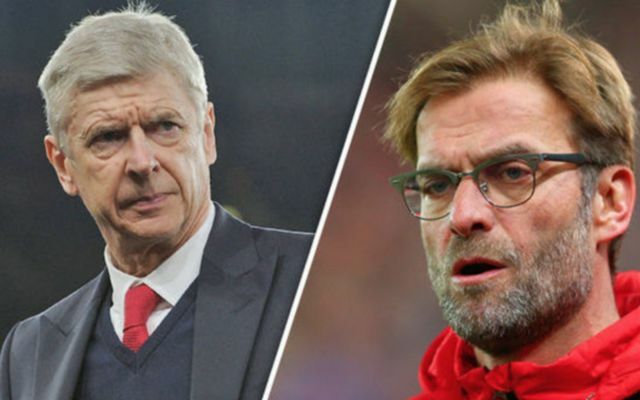 Former Arsenal manager Arsene Wenger has discussed Liverpool’s defeat to Paris Saint-Germain in the Champions League on Wednesday night. The former Gunners boss, who does occasional punditry work in his native France, believes Liverpool were lacking enough quality in their attack to undo a rock-solid PSG defence. Wenger praised Thomas Tuchel’s side for the way they dealt with Liverpool, particularly with the performance of their defence on the night. ‘Paris showed a lot of determination, really drew on its resources,’ Wenger is quoted in L’Equipe. ‘Liverpool pushed a lot but lacked construction behind. Liverpool did not have enough play to put PSG’s defence in danger. PSG were well beaten 3-2 in the first meeting between these two teams at Anfield earlier in the season, so this was undoubtedly a big improvement as the likes of Thiago Silva and Marquinhos were in superb form. Wenger, meanwhile, has been linked with the Bayern Munich job in recent times after finding himself out of work since leaving Arsenal in the summer. The 69-year-old has supposedly been discussed by Bayern chiefs as a candidate to replace the struggling Niko Kovac, according to Bild, as translated by the Mirror.